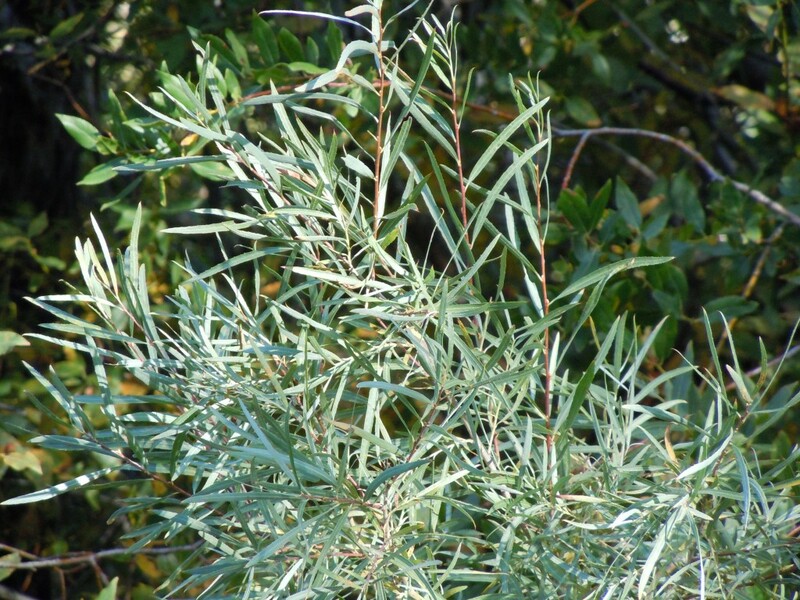 Salix exigua is a shrub to 3 m tall, extensively colonial, many thin stems, bark reddish-brown, new growth whitish-hairy, becoming green and smooth, stipules tiny, or none. Leaves alternate, linear, 5-14 cm long, 0.5-1.4 cm wide, pointed at both ends, margin with distant, tiny, spine-like teeth, new leaves hairy becoming smooth, both sides pale gray-green, plants attacked by insects produce hairier leaves; leaf stalk very short. Flowers Dioecious, in catkins, often produced twice, spring and summer, short, pale yellow in small clusters. Fruit dry capsules 0.5-0.8 cm long. Origin: Native to the Western United States (USDA, NRCS 2010). Habitat: Open wetlands, usually planted, naturalized, soil pH 6-8.5 (USDA, NRCS 2010). Notes: Leaves eaten by small, shiny black beetles, Plagiodera versicolora (the imported willow leaf beetle, see S. discolor) (Johnson and Lyon 1991; Stokes 1983).